Last month KALW radio invited three guests to talk about the city of Oakland’s fiscal problems. To give the city’s official perspective was assistant city administrator for finance Scott Johnson. Daniel Bornstein of the Oakland Tribune was there to provide his apocalyptic view on Oakland’s budget, especially its under-funded legacy retirement systems. While they’re night and day in their depictions of Oakland’s fiscal health, Bornstein and Johnson tend to agree on solutions; both favor reducing city employee pay and benefits, and both see Oakland’s budget as unnecessarily swollen with debt. 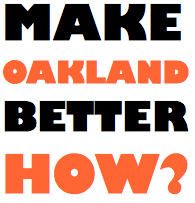 For a community voice KALW chose a somewhat unlikely guest, Jim Blachman of Make Oakland Better Now!, or MOBN! Blachman wasn’t really a different voice considering the other two guests. He agrees with the general trope of financial scarcity both Bornstein and Johnson take for granted, and the need for the imposition of austerity upon Oakland’s residents. So KALW set up a discussion between three white male budget hawks to talk about the fiscal problems of a city that is mostly non-white. It’s as if CNN invited Paul Ryan, Charles Krathammer, and Grover Norquist to come on and talk about the U.S. budget situation and pretended this was a reasonably balanced panel – three white men from the government, press, and civil society, all who would like to impose big cuts on state spending, excepting the military/police. The choice of Jim Blachman to represent a voice from Oakland’s engaged activist community was a strange one because MOBN! has by all measures a very small constituency and only fleeting history. MOBN! was established in 2009 by eight individuals with the intention of eventually incorporating the group as a 501(c)4 non-profit. While MOBN! has added and lost a few members over the past three years, its membership remains small compared to other civic leagues and activist organizations involved in Oakland politics. The corporate form MOBN! is aiming to become, a 501(c)4, is classified as a non-profit “charity” under the IRS tax code. These types of charities are allowed to participate in political campaigns, and in recent years the Super PACs used by wealthy individuals to shape national politics have proliferated under the 501(c)4 form. A search of the IRS database for charities shows no record of MOBN! having obtained recognition of exemption yet from the federal government. Founding members of MOBN! back in 2009 included current City Council member Libby Schaaf, as well as a couple real estate agents, and a political campaigner linked to Larry Tramutola. Jim Blachman was there too as an executive officer of the group, and remains a board member today. The discussion on KALW, which included a lot of echoing statements by Bornstein and Blachman was illustrative of what MOBN! 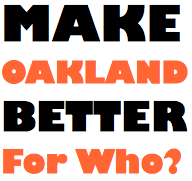 thinks would create a “better” Oakland. Basically the group sees Oakland’s budget problems as a crisis caused by inflated municipal employee salaries, healthcare, and retirement benefits. In all of their materials they ignore the fact of dramatic declines in tax revenues available to California cities in recent decades, and widening inequality between the top one to twenty percent of America, and the bottom 90 percent. Their political solutions therefore call for attacking labor unions and employees, and cutting services that predominantly benefit the city’s poorest residents. They do not call for progressive tax measures to raise more revenue, or other means of reducing wealth and income inequality and access to public resources within and beyond Oakland. Blachman is a typical California anti-tax, pro-austerity activist focused on attacking labor unions and undermining services that urban communities of color rely upon for survival. Like prior conservative activists who focused on slashing budgets and cutting taxes in the Golden State, Blachman and other MOBN! activists don’t focus on culture war issues – in fact some of them are rather liberal on issues of gender, sexuality, women’s rights, and they’d even claim to be racially progressive, notwithstanding the fact that the economic and political reforms they’re calling for would disproportionately harm Black, Latino, and Asian immigrant communities. Instead these conservative budget activists fixate on spending, and they make arguments that are logical, but only within a de-politicized framework in which we have to accept the current state of inequality as a given. Blachman is similar to other prototypical California conservatives in that the political solutions to the budget problems he focuses on are linked to his day job; he works for powerful and wealthy interest groups that have spent enormous sums to shape tax laws and exploit tax loopholes in order to hoard capital amongst the wealthy and owners of real estate, favoring a privatized vision of society. Blachman’s day job is with Advisor Partners, an investment advisory company located in Lafayette. Advisor Partners develops various technical strategies for use by investment management companies to maximize wealth retention for high income individuals. One of the company’s marquee services is known in the industry’s parlance as “active tax indexing.” When you boil down all the complicated steps involved in active tax indexing, you’re left with a tax avoidance strategy that allows wealthy individuals to avoid paying capital gains taxes on stocks and other traded securities, or to carry these tax write offs over and thereby offset other taxes on the wealth and incomes of high net worth individuals. Blachman called this “the quest for tax Alpha,” referring to the somewhat mythical quantity of the fully maximized rate of return on an investment. As I noted in a previous post most Oaklanders are living below the state’s median family income of $57,000, and only a small proportion of the city’s residents own stock and other securities holdings in significant amounts. Oakland’s leaders are currently investigating how the conspiracy of a few global financial companies to rig the London Inter-Bank Offered Rate affected the city’s finances. Sources in City Hall say that the theft may amount to more than $300,000. 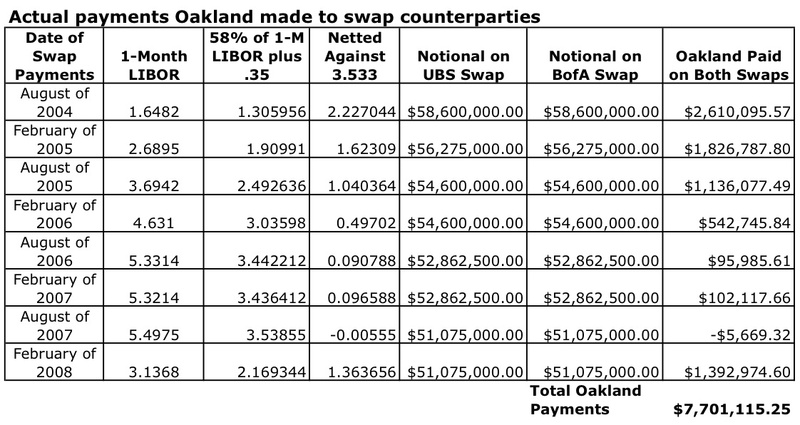 Oakland’s losses are due most likely to interest rate swaps the city agreed to with several banks in the mid-2000s. In 2004 Oakland sold $117 million in variable rate bonds. The underwriters of these bonds, Bank of America and UBS attached interest rate swaps to these variable rate bonds. The swap payments involved a two way flow of funds between the city and the banks that was intended to convert the variable rates on the bond debt into a “synthetic” fixed rate. Under the terms of the two deals with Bank of America and UBS, Oakland paid the banks 3.533 percent, and in return the banks paid 58 percent of the 1-Month LIBOR rate, plus a “spread” of 350 basis points (0.350 percent). The LIBOR-linked rates the banks paid Oakland were intended to mimic the variable rates on the bonds, thus passing through Oakland to service the bond debt, leaving Oakland paying the fixed rate of 3.533 percent (thus the “synthetic” label). 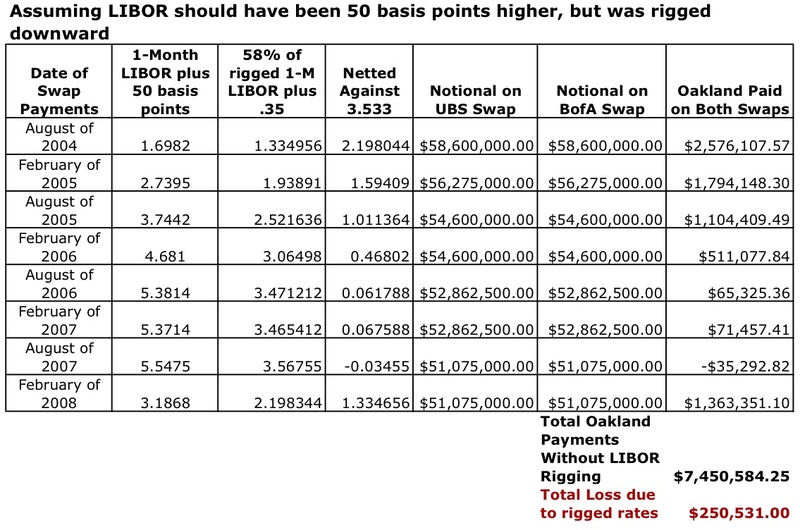 However, because UBS, Bank of America, and other banks that were part of the panel that set the different LIBOR rates, rigged LIBOR downward over various years, Oakland ended up paying more than it should have. It was theft, plain and simple, even though it occurred through a complex financial architecture invisible to most. The terms of Oakland’s interest rate swap agreements with UBS and Bank of America can be viewed online here. To assess just how much money was stolen from Oakland by UBS and Bank of America we must determine when, and by how much the banks manipulated the rates, and in what direction. Financial analysts employed by many local governments and public agencies are currently doing this tedious work, including inside Oakland’s finance and legal offices. To help the public understand how the conspiracy worked, and just how much it may have affected Oakland, I’ve calculated the following guesstimate. Let’s assume that since 2004 the banks rigged the LIBOR rate downward by an average of 50 basis points at any given time. This is a really sloppy and imprecise assumption as the banks might have rigged the rate upwards and downwards over time depending on what rates would have benefitted them in the ever-shifting world of finance. Rigged rates could have been jacked up a lot during some periods, while only a little bit during other periods, or downward by big and small margins. For the sake of simplicity let’s just assume the average impact of the LIBOR rigging conspiracy over the terms of Oakland’s swaps with UBS and Bank of America was negative 50 basis points, or -0.05%. The following table shows what Oakland probably actually paid between 2004 when the swaps were signed, and 2008 when the city terminated the swaps (they were originally intended to run to 2026). Assuming the LIBOR rate wasn’t rigged would mean that after netting out Oakland’s fixed rate against the bank’s LIBOR-linked variable rate, Oakland paid the banks approximately $7.7 million. If LIBOR during this period was skewed on average by negative 50 basis points by the banks, it would mean that the variable rates paid by the banks to Oakland were lower. Under this scenario the net flow of payments would have been even further in the favor of the banks. The following table adds fifty basis points back to LIBOR, simulating what the banks should have paid in the absence of the conspiracy. Under this hypothetical scenario the banks should have only received $7.45 million from Oakland. The difference of a quarter million here is the amount that the banks might have stolen from Oakland. Then there’s the termination payment that would have been made in the Spring or Summer of 2008 by Oakland to close out the swaps. These termination fees are calculated using the “fair value” of the swap. The swap’s value depends on where LIBOR is at, and where it’s trending. Thus if the banks had been rigging LIBOR downward over time, and pressing down very aggressively during the financial crisis, Oakland’s termination payments would also have been skewed in the favor of the banks. So an estimate of $300,000 seems to be a reasonable, if conservative, estimate of how much was stolen from Oakland by UBS and Bank of America.